There are 3 things in our houses that we all dread to clean the most; the range hood, the oven, and the shower. For me, a clean shower needed a heavy duty foamy spray that clung to every surface… just like the cleaning industry tells you. I’d use almost 1 whole bottle of shower cleaner on the shower, and it would only make a small difference. But it got the streaks of shampoo and soap off the glass door and it smelled like chemicals, so it had to be clean… right? I (am I’m guessing a lot of other people) am a shower scrubbing procrastinator. The amount of preparation it takes to clean the shower with a smelly and harsh chemical cleaner pretty much makes the entire process exhausting and you tell yourself you’ll do it next week. I mean, you need gloves, a mask (I’m asthmatic), an old singlet top or t-shirt and shorts (not that easy to scrounge up when you’ve been country-hopping and baby-popping in the past year like I have, but I’ll find something) because you don’t want to get the chemicals on your decent clothes and have them bleached, an old towel or bath mat to stand on in the shower for the same reason (and you don’t want to slip and crack your head, nor catch a weird foot thingy), a pair of thongs are optional (flip-flops for you non-Aussies), plus you need ventilation from the exhaust fan and an open window, a scourer, a cloth, and a watering can, jug or bucket if you don’t have a detachable shower head! No wonder my mother out-sourced the job to my brother and I when we were teens; it’s so draining! And even after I’ve cleaned it, I have to spray the bathroom with air freshener just to get it to stop smelling like a public pool. And I even feel like I should be wearing thongs in it for the next 3 days. A clean shower shouldn’t make you feel gross. There had to be a better option. 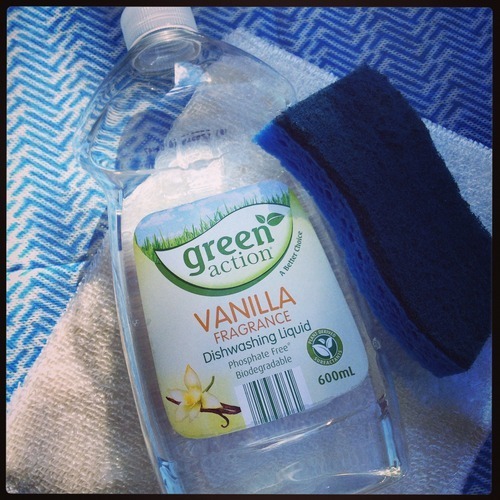 I’ve tried commercial ‘green’ bathroom cleaners before, and whilst they work great on the sink, toilet and tub, they just aren’t powerful enough on the shower. So I turned to handy-dandy Pinterest, and I found a link to A Slob Comes Clean. And as you can see from the top picture, they say that you can clean a shower with only dishwashing liquid and a scrubber! Yes! That was the sort of thing I was looking for; cheap and easy (we all have it at home! ), and judging by the pictures on the other site, it actually worked!! I decided to give it a go. I trust dishwashing liquid enough to eat off the items its touched, so I wasn’t too worried about it attacking my skin. I forwent the gloves and mask; the liquid I chose was a delicate vanilla scent that didn’t smell like a cleaner at all. I didn’t even need the exhaust fan. And I used the same brand of scrubber that I use on my dishes, a scratch-free one that’s good for Teflon coated pots and pans so I knew it would be fine on the tiles. It took 30-40 minutes, lots of muscle power and approximately 400mLs of detergent, but I got my shower to a respectable state. 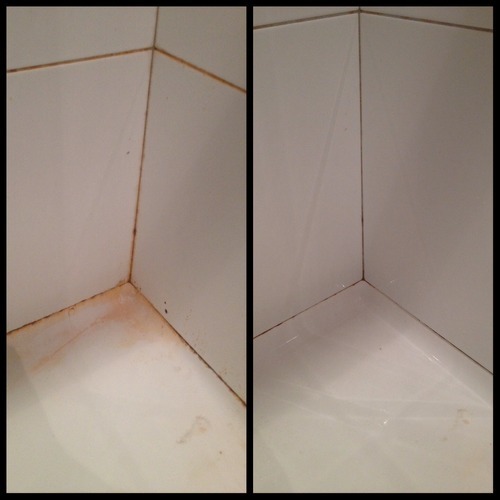 As you can see in the above photo, all the pink scum in the before photo has been scrubbed off, even the grout is clean! I didn’t include pictures of the glass wall or door, I was running out of elbow grease and they didn’t come up as well, but half of the scum still came off! This will now my go-to shower and bath cleaner. I’ll be saving $5-6 a bottle on shower cleaner, and I’ll be saving in the health department too. I don’t have to worry about Miss G accidentally ingesting it through her bath water or bath toys, or CTO and I getting bleached from the chemicals, or my lungs being lined with a layer of gunk. Wet sponge, then squirt liquid onto the sponge or directly onto the shower surface. Scrub surface, and rinse sponge and repeat as required. Notes: You will need to stand on an old towel or floor mat when doing this, the dishwashing liquid makes it very very slippery! Please be careful!